Originally posted: August 2, 2017 . Last modified: February 25, 2019 . 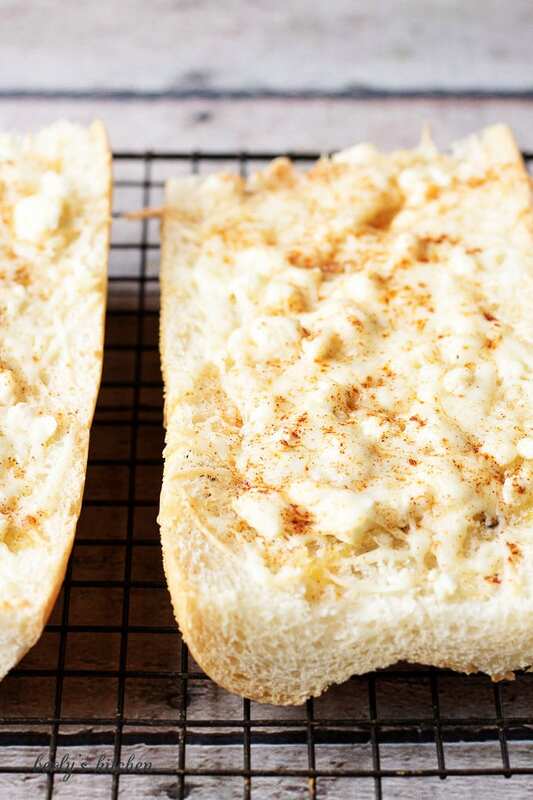 Feta mozzarella topped cheesy bread is the ultimate compliment or starter to any meal. We took Cuban bread, topped it with feta, mozzarella, and garlic. 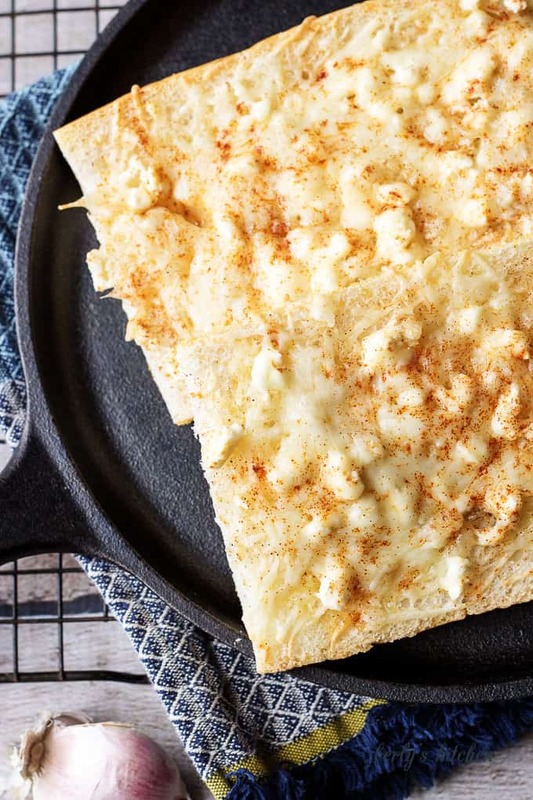 For today’s recipe, we wanted to share one of our favorite cheesy bread dishes. The inspiration for this offering originated at a restaurant I worked at years ago. The original appetizer was referred to as Greek Bread. Unlike like our cheesy bread, it was served on an Italian loaf. It was wonderful appetizer for pasta dishes. Since we live in South Florida, I wanted to add a bit of Cuban flare to the cheesy bread. So, I substituted Cuban bread for the Italian loaf. If you have never had a Cuban sandwich, then you may not be familiar with their bread. Let me tell you, it is something special! The loaf has a crispy crust and a soft, tender interior. It is similar to a French loaf but differs in the fact that the inside stays moist even when it’s grilled or toasted. 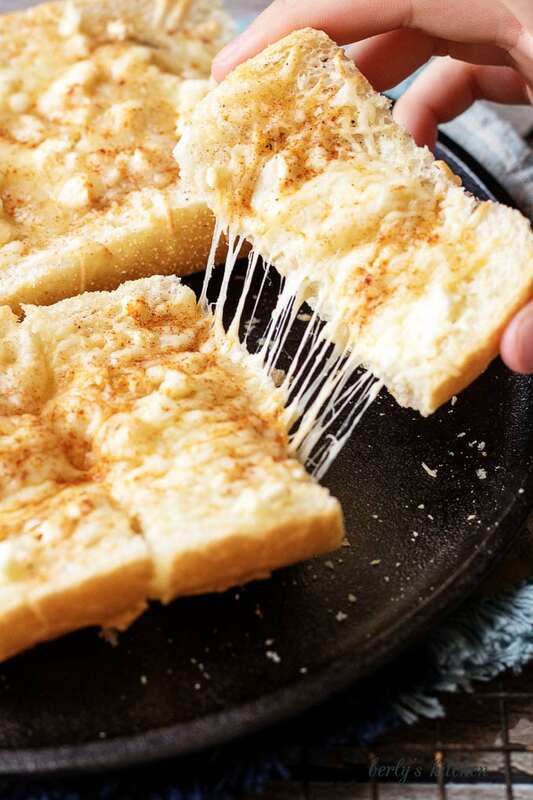 For that reason, it’s perfect for our cheesy bread. However, if you are unable to get your hands on Cuban bread, a large French loaf can be used as a substitute. If you prefer crunchy bread, then go ahead and use the traditional Italian bread. Personally, I like my bread soft, so I always avoided using that type. For the cheese, mozzarella is an obvious choice. Mozzarella is rich, salty, and it gives any dish that “stretchy cheese” effect. For people unfamiliar with feta, it’s a strong cheese. Feta has briny flavor and it doesn’t melt very well. But, it works beautifully on this cheesy bread. When used in combination with mozzarella, olive oil, garlic, and paprika, the heavy taste is reduced a bit and helps to highlight all the other ingredients. Whether you are familiar with these ingredients or not, I invite you to prepare this cheesy bread recipe. This bread pairs wonderfully with a tomato based pasta dish. On the other hand, Kim loved it with a simple homemade ranch dressing. So, how you enjoy it is up to you. In closing, I wish you a long life, love everlasting, and a tummy full of cheesy bread. Feta mozzarella topped cheesy bread is the ultimate compliment or starter to any meal. 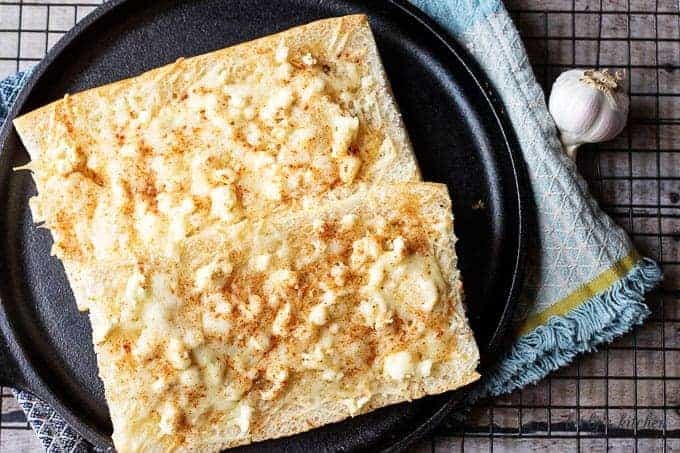 We take Cuban bread, then top with feta, mozzarella, and garlic. First, preheat your oven to 350 degrees F. and shred your mozzarella cheese. Next, slice the loaf of bread lengthwise and brush the bread with olive oil. Then, sprinkle the pepper and garlic on the bread. After that, add the feta and mozzarella cheeses. Afterward, sprinkle the paprika over the cheese and place the bread in the oven to cook for 10 to 12 minutes or until the mozzarella cheese has melted. Last, remove the bread from the oven and cut it into four equal sizes. 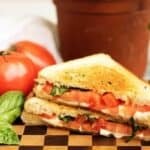 It can be served with marinara or ranch dressing for dipping. The calorie count listed is an approximation based on the ingredients. Actual calorie count may vary depending on what products are used during preparation of the dish. Bread can be stored in aluminum foil in your fridge for up to two days. I love home made cheese bread, in-fact it is one of my very favorite foods. I could eat it everyday. This is pretty different than the recipe I have been making for years. I’ll have to give this one a try. Looks so yummy. No joke, I was thinking of doing something similar the other day. I would have never thought, however, of putting feta and mozzarella together. Sounds like a delicious combination. I am drooling over here. Oh my goodness – cheese and bread, what’s not to like! 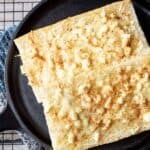 I have never melted feta cheese before but I like the idea of adding a Cuban flare to cheesy bread. The addition of garlic makes this perfect! Oh my gosh! This looks so good. I need a side dish for a pasta dinner we are going to in a few weeks. This one might be it! I think the guests would love it! Can I just have some of this right now?!? I am currently doing Whole 30, and I’m at that stage where I just crave all the foods. I will definitely have to make this in the future, though. I have never used cuban bread before to cook with. In fact I did not know there was a “Cuban” Bread because the cuban sandwiches in NY are made with other breads. Will have to look for it next time I go shopping because I want to try this recipe. I would’ve never thought to make something like this! It looks so delicious, my husband would LOVE this! I have never seen such a flat top cast iron pan before. I bet it would also be great for pancakes! These do look rather delicious too. Oh gosh this looks SO good! Seriously, cheese is my weakness but especially mozzarella! It’s my favorite and I love cooking with it. Such an amazing recipe and I will definitely be trying it out! YUM! Bread and cheese are a match made in heaven!! I never actually would have thought of combining feta with mozzarella, but I can see how they would make a great combination!